Harry Kane has already scored this season. Twice. He capped a win over Fulham with his fifth strike in his previous four home games and then powered in a header to open the scoring in Spurs' big win at Manchester United. 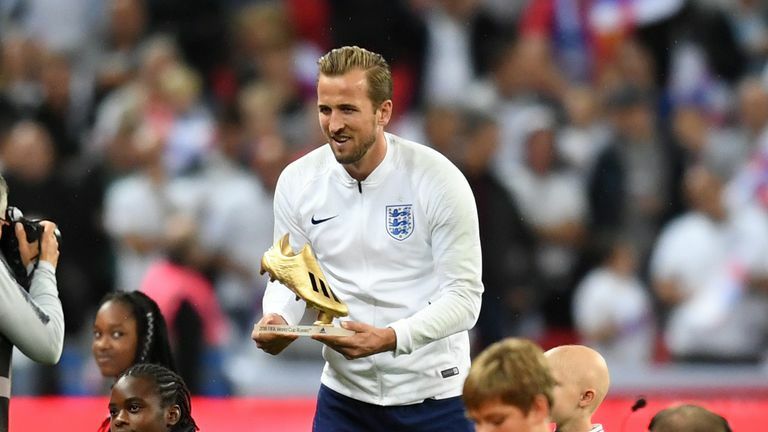 In the summer there was the small matter of winning the golden boot at the 2018 World Cup. Any suggestion that Kane is performing at less than his best risks ridicule - and yet, there is some substance to it. He has started 61 games since the beginning of last season and the fatigue questions has come up, especially after Kane himself conceded he was a little disappointed with his levels in Russia. Kane was left out of the starting line-up for England's friendly with Switzerland on Tuesday, coming on as a substitute for the final half-hour in Leicester, but there is no chance of him missing Spurs' clash with Liverpool on Saturday. Kane will play on, despite observers pointing to a declining shot rate as evidence of him dipping. That stat matters. Shot volume was an early indicator that Kane's scoring was repeatable back when he was labelled a one-season wonder. It separates the best from the rest. Look at the list from the past five seasons in Europe's major leagues. Cristiano Ronaldo tops it with 590 shots but Kane is right there with 574. Lionel Messi? Third with 550. Sergio Aguero is fourth but nobody else has had 500 shots. These players do not have lots of shots because they score a lot of goals. They score lots of goals because they have a lot of shots. There is too much noise with goals. The sample size is smaller. Shots are a better indicator of future performance. So when shot numbers dip, expect goal numbers to follow. And while Kane has failed the eye test of late, whether it's taking too long to get a strike away or stretching in vain to reach the ball, the stats show that the shot numbers have tumbled too. Kane's consistency was remarkable for much of last season. His rolling five-game average of shots per 90 minutes never once dipped below 4.5 until he succumbed to an ankle injury in Tottenham's win at Bournemouth in March. A three-week gap in the fixture list meant he was back on the pitch for the very next Premier League game. But was he really back? That same rolling five-game average of shots per 90 minutes has not been above 4.5 again since. It is currently down at 2.6. Kane has not had more than four shots in any game this season. The only time he has had five in a game since the injury was against West Brom. By way of comparison, he had fired off six shots in a game 17 times in his previous 27 starts. It is a material and noticeable shift in his game but why is it happening? Given that the injury against Bournemouth marks such an obvious cut-off point, it makes sense to consider the fatigue factor despite Mauricio Pochettino's insistence Kane would not play if he were unfit. There are clues in the Premier League tracking data that hint at a lack of sharpness. According to those statistics, the top speed Kane has clocked for Tottenham in the 12 games since his injury is 32.2 kilometres per hour. That is the fastest he has run in 1000 Premier League minutes since his return. But Kane had hit that same 32.2 kilometres per hour mark in eight of the previous 24 matches in the competition. It's a big change. This is not the only factor, however. A lack of sharpness may have been the catalyst behind the dip, but perhaps the biggest reason why Kane is now having fewer shots is the change in emphasis in his game. He was mercilessly mocked for perceived selfishness when claiming a controversial goal at Stoke in April, but he is bringing others into play more than ever. It is early days this season but Kane's per 90 numbers for assists, chances created and big chances created are all up on last year and part of the explanation for that is that he now has runners beyond him. It was Kane's forward pass that set up Lucas Moura for the second of his goals in the 3-0 win over Manchester United at Old Trafford last month. Kane has the strength and composure to play that role. That has been evident with England too, where Gareth Southgate has preferred to play him alongside a strike partner. Kane spread the play wide in the build-up to Marcus Rashford's early goal against Spain and threaded another pass through to him from which he should have scored after the break. The arrival of Moura at Tottenham means that even when Kane is not getting as many shots away, the team need not suffer. The hope is that it will help. Pep Guardiola once famously referred to Spurs as 'the Harry Kane team' but Pochettino knows they must find other solutions if they are to take the next step. He has even said as much. "If we want to win something, if we want to challenge for big things," he said, "we all need to put our minds and energy into the collective and understand that the collective is the most important thing. If individual goals and targets are the priority for them, it's sure that they are not going to help the team and that is why they are going to be out of the squad." With this in mind, a useful statistic to note is the number of touches Kane is having in the opposition penalty box. As with the number of shots, that number has dropped since the injury in March, but the shortfall has been made up by others. Against United, it was Moura who had the most touches in the box. Dele Alli has had as many as Kane this season. He is still involved. He is having as many touches outside of the box as he has ever had. But interestingly, while the percentage of touches he is having outside of the box has increased, the percentage of shots he is having from outside of the box has dropped significantly. What has actually happened is that he has cut out the speculative efforts. This was something for which Kane had been criticised. He had 62 shots from outside the box last season but is yet to attempt a single strike on goal from outside the area this season despite a greater proportion of his game being played in that zone. His percentage of shots from inside the box has gone from 62 per cent prior to February to 83 per cent since then. Fitness concerns cannot be ruled out. They may well be a factor. But it seems just as likely Kane's role in the team is also changing and he is displaying a greater maturity to his play. It might mean that Kane's prodigious scoring has now peaked at the age of 25. But the hope for Tottenham supporters will be that the team's peak still lies ahead.